The problem of flatulent cows is leaving farmers with more than merely a bad smell. 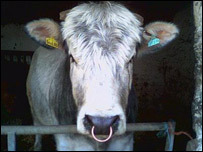 The humble cow is now considered more responsible for global warming in the United Kingdom than the transport industry. A single dairy cow could be producing as much as 500 litres of methane per day and there are more than two million of them across the UK. The gas that the animals' produce after a good feed is about a third of all such emissions in the UK and the agriculture industry is under pressure to clean up its act. But how do you stop the cows' 'bad wind'? Ian Buchanan has been farming near Dungiven in Northern Ireland all his working life. He said cows did produce a lot of methane gas; milk, butter, cheese and meat comes at a price. "In some places, in north America, they reckon the livestock production would be responsible for up to 20 per cent of the methane gas in those countries," he said. "They reckon it is between seven to 10 per cent in the United Kingdom. 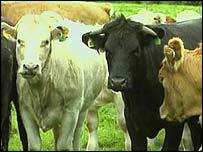 If you have to produce food you are going to produce methane gas from animals." Farm animal waste is now considered a major threat to the environment. Last week, at a farming conference in Oxford, Environment Secretary David Milliband warned the farming industry to expect heavy fines if they did not control the gas levels. One answer, said Mr Buchanan was to feed the animals young grass. "We are already doing that in Ireland. We cut the grass fairly young for the silage for the winter keep and that really does help. "If you wait until it gets stemmy and long, it takes more bacteria to break it down in the cow's rumen (stomach) and you produce more gas." The animals also produce less gas if they eat silage as opposed to hay. This is currently the practice in Northern Ireland. "Part of the fermentation takes place in the silage pit, thus there is less methane produced by animals eating silage in comparison to hay," Mr Buchanan said. However, adjusting feed is only part of solution and government now wants farmers to generate biogas from animal waste. But how practical is that for the ordinary farmer? Mr Buchanan said it was possible, but only with support. He has visited a plant in Denmark which used pig slurry to convert into electric for the grid. However, the project is heavily subsidised. The farmers' message is simple. Any such plans must come with strong government backing. "They are going to have to put their money where their mouth is," Mr Buchanan said. "It would not stand up that farmers could do that project for themselves." Meanwhile, across the UK, in labs and farmyards, scientists are trying out inoculations, microbes or even extracts of garlic in an effort to cut down on the methane.